Utilizing unique fade patterns, graphics gradually fade to solid at the rear with the unique dot matrix pattern as shown. Available in four (4) Fade colors (Silver Fades shown). 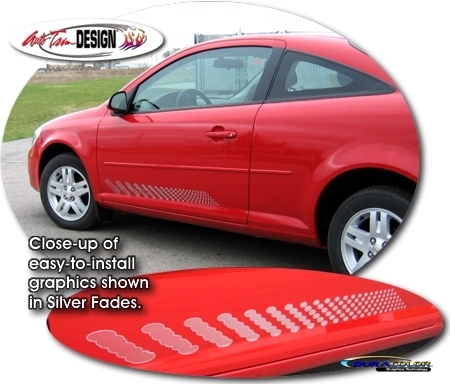 Very easy to install, this graphic kit measures 42"x 3.7" (106.68cm x 9.4cm) and will fit any '05-'10 Chevrolet Cobalt or '07-'09 Pontiac G5.